Another fine forecast so we decided to to cycle a circuit of the lake. We started along the Eastern shore. The majority of the route round the East side was either on cycle paths or minor roads. There was only one section of a few km where we had to join the road. It had good views of the lake and mountains and the path was closer to the shore than the route on the old railway line . There was one short hill which was a bit of s surprise for s circuit round a lake. We followed the path to the of the end of the lake and then joined the path on the western side on the old railway were had cycled on the day before . We diverted off the path at Douscard and found a small grocers and purchased two slices of quiche and a wholegrain baguette for lunch. We then continued to Saint Joripz where we diverted off the path. Lyn had expressed an interest in a small extension to the route she had seen whilst Googling in the morning . I had downloaded the route onto the Garmin. The small extension was a loop that climbed up away from the lake to the Col de Leschaux a climb in stages up to 900m. The route ascended thought the village of Saint Eustache then onto Leschaux. It offered fine views over the lake and down to Annecy. After Leschaux if was a 4 mile fast descent back to the lake bike path with more fine views over the lake. On reaching Annecy we diverted to the old town for an ice cream. After the previous days meagre portion we decided on two scoops each and ended up with a very generous portion. We decided to eat out for a change. A Thai restaurant was selected The Garmin took us within 50 feet but we could not find it. It was eventually located inside an arcade but was closed.A man passing saw our predicament and recommended another restaurant . He did not know the name of it but gave us the street name and said it was one street back from the canal. but freshly prepared and good quality. We had Tom Yum and chicken curry and shared a portion of tempura vegetables to start. After a good meal the Garmin guided us back the mile to our apartment. We awoke to light rain and low cloud. Breakfast was taken on the balcony. Thursday was definitely a better day for cycling. The car was packed, flat tidied and keys posted in the box. We ignored Kate's initial suggestion an opted to drive across country to join the peage after Frangy. Various options for the route had been considered including driving though Switzerland but the peage was least 2 hours faster. The toll cost was 29 euros. A Brexton lunch was taken on route. I was disappointed to find the service area had been renamed from Bois de Villars Robert. The tables were located in a sunny spot away from the traffic. We left the peage with around 100km of driving to go. The route initially followed the Marne valley with its river and long distance cycle path by the canal. Something for s future trip. We arrived at Hotel Bellevue just after 5:00pm . Lyn's french had been understood and we had a reservation for 2 nights including demi pension on the first night. The local bakery ànd Carrefour Express provided provisions for breakfast which we had sitting on the balcony. We decided to cycle the 30 miles along the old railway line from Annecy to Albertville. I had downed loaded the GPX file which was not really needed for the ride but was used to navigate to the start. Our route took us to the lake. The path alongside the lake had a constant stream of cyclists but this thinned at the end of the lake after around 10 miles. It had good views across the lake and to the mountains. from Ugine on a cycle track alongside the road and then on the road.The last section to Albertville was on a path alongside the river. We crossed the bridge and followed the signs for the city centre, locating an open Boulangerie was more difficult then we anticipated but was eventually accomplished with the help of Google maps. We purchaed a filled baguette and then found somewhere in the shade to eat it s the temperature had risen to 32 degrees. The ride back was hard work in the heat and a headwind and gradient slowing our progress. We stopped for a well deserved if expensive ice cream when we were around 6 miles for. Annecy . We continued along the bike path to the end of the lake and the Garmin then directed us back to appartment. A detour to the supermarket provided the ingredients for Lemon chicken which was eatern sitting on the balcony. A ride of 61 miles with a high of around 32 degrees centigrade. It turned out they offered a comprehensive buffet breakfast for 15 euros with homemade bread , cold meats cheese,fish and a range of homemade salads. It was an unexpected treat and we enjoyed a pleasant hour sat outside. The quickest route to Annecy was though Austria around the eastern end of lake Constance. However a vignette would have been required for the short section of Austrian motorway or the motorway avoided. We opted to travel round the western end of the lake . The route took us on minor roads before we joined the main trunk road. We diverted though Singen for fuel and were pleased to find it was 10 cents a litre less than around lake Constance. A vignette was purchased for the car at the Swiss boarder . (40 Swiss francs , about £32). Kate diverted us around one accident and we had a short delay when traffic slowed for a second. A couple of Brexton stops were taken on route. Were arrived at the flat at 7:15. The lock box was opened and keys retrieved. The car park barrier was opened and we finally realised there was a separate tag that opened the front door to the apartment block. The apartment his small but is what we were expecting.its on the first floor and does have a balcony where you can sit an eat. We decided on a takeaway pizza for tea. After a a bit searching on Google we found a suitable restaurant about a 5 minute drive away. Unfortunately they was nowhere suitable to parked to we drove back to another takeaway we had passed. We were served by a tattooed lady in a shop filled with an interesting collection of Star wars memorabilia. The pizzas were cooked in a wood fired oven.The artisan pizza had an inch thick base and we opted to share a slice. We drove back to the appartment and eat the pizza with a freshly prepared salad. We left the hotel after breakfast. It was a pity we could only stay one night. We drove the 20 minutes to walled town of Rothenburg on of set Tauber. We parked by the walls (1.2 euros per hour or 6 euros all day) and went off to explore the town, Lyn by bike and Robert by foot. We had coveted over 4 miles by the time we returned. The town hall bell tower was a good vantage point for views of the town. It cost 2.5 euros but you only had to pay if you made it up the step sets of wooden stairs. Not all visitors did. A baker provided a roll and coffee for lunch and we purchased a "snowball" before returning to the car. They looked to be a popular local "biscuit "
The are pastry cut into strips formed into a ball then put into a mold and deep fried . They were available in its of flavours but we opted for cinnamon sugar. The drive to Wolfegg was around 2:30 hours. We made good progress so stopped for a coffee and called Mattheus when. Kate said we were 30 minutes away. We had come off the .motorway and had not factored in the 20km diversion . We afrived 15 mi utes lat8.Matttheus was very friendly and showed us round the appartment. The apartment was an excellent find. Its 60 metres square so has. lots of room. It's on the first floor of an old converted building. The forecast for the day was heavy showers so rather than having a ride near lake Constance we decided to ride from Wolfegg. The Danau lake Constance cycle route runs thought the town so followed north to Bad Waldsee. The route followed minor roads out of the town and included unpaved sections of track. It was well signed posted but I had downloaded the GPX file go the Garmin.We arrived Bad Waldsee at lunchtime and shared a pizza sliced and had a coffee from the local bakers. The forecast rain did not materialise so we continued on the Danau cycle route for a further 6 miles to the tiny hamlet of Amplebronn. As we arrived back in Bad Waldsee the sky's darkened and the first spots of rain started to fall. After a coffee and cake the rain stopped and we continued on our way back. Lyn had spotted a small wine shop in Bergatreute a village about 8 km from Wolfegg on our way past in the morning so we stopped to investigate as we went past. We were unsure if it was a wine merchant or bar. It turned out to be a small wine merchant who normally only opened for a few hours at the weekend but was having a wine festival for his clients. We were invited inside and were soon sampling wine and eating some delicious food. We started with some German reds then moved on to Italian snd Portuguese reds followed by German whites. Wines were selected to pick up later and we slowly cycled back to Wolfegg. We arrived in breakfast at the time they we were told breakfast sould stsrt being served only to find the rest of the guests already eating. Lyn and I eat most of the fresh fruit that had been out between us. Having checked out and packed the car we drove 20 minutes to Boppard for a ride along the Rhine to Koblemz. We initially parked on parking bay on the road near the station. However we were concerned the spaced may have been in a restricted parking zone so moved the car to the station car park. We found a space but there was not information on how to pay for the parking or any nformation on the parking costs. The bike path to Koblemz follows the banks of the Rhine . It runs alongside the main road to Spay where the main road moves away from the river bank but the cycle path continues to follow it. until the point the Moselle joined the Rhine. We then diverted into the town and eventually found a cafe for lunch. It would have been worthwhile spending more time in the town but we needed to get back to Boppard. More photos and video were taken on the return . We made it back to the car to find it free from parking tickets and wheel clamps. The journey to Gasthoff Wilderbad should have taken just over 3 hours according to Kate. In the end it took around 4 hours without any stops because of the delays caused by the traffic.We arrived just after 7:30. The car park was located at the top of a hill level with the second floor of the Gasthoff. We parked and then carried our cases down to reception only to find our room was located on the second floor of the annex building and we could have carried the cases across the footbridge from the car park. We were concerned the restaurant may have stopped serving but fortunately it served until 8:30. We had time for a quick shower in the room before dinner before going down to the restaurant and having a splendid dinner of braised beef served with homemade noodles and a side salad. Some of the deserts were homemade so we shared a cheesecake and red fruits soaked in rum served with ice cream for desert. All washed down with Weis beer and a local wine. After an average breakfast . We drove the short distance to Emmelschausen. The parking place we had found yesterday was full so instead we parked in a car park by the park and start of the bike track along the old railway line. We retraced yesterday evening route for around 5 miles before turning off towards Oberwesel. The first few miles were on minor roads but the route then became a gravel track. It was a long decent down to the Rhine. We had our first site of the river as we emerged from the trees. The track finally became paved and we continued the descent to Oberwesel,. A section of the bike path was closed so we continued along the road We stopped for a coffee and snack before heading along side the Rhine towards Boppard as distance of about 12 miles. The bike paths is traffic free but runs pn the pavement along side the road. It offers good views across the Rhine. We then continued to our hotel. It's an an old mill located a few miles from Emmelschausen. We must be the only English couple staying as we were shown straight to our room and given the key without even having to give our name. After a refreshing cup of English tea we drove back to Emmelschausen and cycled s section of the old railway line. We cycled for around 8.5 miles before we had to turn around . We eat in the hotel. A chicken and middle soup to start followed by venison and wild boar goulash served with red cabbage and potato dumplings. An unfortunate mistake with our German meant we had 2 glass of wine to drink rather than an e tea one to share. We returned to the room to update diaries a d plan Tuesday's ride. We booked the night ferry from Hull so had plenty to pack the cases and car as the ferry sails at 20:30. The trip over the M62 was uneventful. A temperature of 25 degrees was recorded on route. After a short wait to get our boarding passes we are on board the ferry. The bikes are on the back of the car so we had to park with the cars rather than the high vehicles and lorries this year. An evening meal in the Brasserie had been booked for 8:15 and we are looking forward to a pleasant crossing and a digestive in the piano bar. We were down for breakfast just after 8,00 and each had an omelette again. We sat outside on the patio making the most the morning sun and view . The owner of the Bodegas came over and introduced himself to us. He was very friendly and asked if we had enjoyed our stay. We had seen him driving a van and assumed he was one the workers. By 10:00sm we were ready to set off. We made it down the single track road without meeting an on coming car. We needed to find a bin to dispose of the cardboard trays we had used to store the bikes in.Recycling bins can normally be found on the outskirts of small towns and villages on the island. We could not find anything in Porreres and diverted off our route to Montuiri and again drew a blank. We did find some bins in Algaida but they were in a locked compound so gave up looking and continued to the airport . The van was refueled when we reached the airport and we finally found a skip at the next gsrage we passed. We returned the van, it passed the inspection and we walked across to the terminal. There was a large queue at the Jet2 check in but we were directed to separate desk at the front of the queue because of the bikes. The flight was uneventful. We were a little late setting off because of passengers beginning transferred from a cancelled flight to Birmingham.We sat in the emergency exit seats again towards the plane. Lots of leg room but we were the last to be served refreshments and most things had run out by the time they reached us. A strong tail wind meant we made the time up on the flight. We decended thought the clouds to Manchester and landed in light rain. Road works and traffic on the M60 meant it took about an hour to get to Lyn's. Another ride from the Bodegas. First we cycled into Porreres. The post office was open, stamps purchased and holiday postcards finally sent. This time we turned towards the town going round on the ring road. The turning for San Salvador is about 1 mile out of the town off a busy main road. The climb is steeper than the climb to Lluc we had done earlier in the holiday. The average gradient is 6.4 percent but had km sections at 10 and 12 percent. 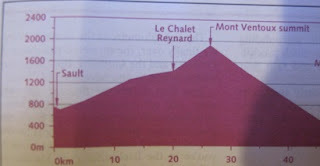 The profile we looked at on the Sunday evening showed a peak of 17 percent towards the top of the climb. As you ascent the climb winds its way round the mountain offering good views of the plain below and the coast. Robert cycled ahead completing the 4.8km climb in 22 minutes and 34 seconds. After a couple of quick photos he returned down the climb to meet Lyn and cycle back to the top with her. When she reached the top we spent some time admiring the views. We had an expensive small coffee in the cafeteria but decided to get some lunch in Felanix. We decended stopping at a couple of view points for more photos . Finding a bakery in Felinix proved to be more difficult than we anticipated. After a visit to the tourist information we had a map with 3 bakeries marked. They all turned out to be either closed down of shut for lunch. We ended up abandoning the idea and instead returned to Porreres on another minor road and track. Fortunately we decided to share a piece of cake in L' Escrivania as it was much larger than we expected. We returned to the Bodegas. A round trip of 35 miles with 687m of ascent. Bikes were packed in the bike boxes and cases sorted for Tuesadys flight before we enjoyed a tasty 4 course meal. On uploading the route to Stsva Lyn was please to find she had made it into the top 3 of all time women results for one 30 mimute gravel section back to Porreres . One better than her top 4 placing for the previous day on a different section.